Strategies to help children eat better. With back-to-school comes a return to bagged lunches and after-school snacks. For a lot of parents, this poses a challenge – how to prepare food that’s healthy but that kids will actually eat. No parent likes to see food come back home or find out that they’ve been feeding the garbage bin! It may seem silly but you want to take away any of their potential reasons for not eating their snack. For example, biting into an apple might be just the excuse they need to put it back in the lunch box. Cut the apple up and put it into an airtight container. Ambrosia apples are great for this because they are naturally slow to brown so they’ll look fresh and tasty hours later when junior gets to them. Who wants to eat boring food? Unfortunately, a lot of the items that fall into the healthy food category also fall into the boring food category for kids. Make it a little more fun. Cut fruit and veggies into shapes, give them something healthy to dip it in or create a bit of an adventure or story around the food. What kid could resist eating an Ambrosia apple that looks like a rose? Kids are more likely to eat healthy if they see parents happily eating healthy. This goes beyond overly-dramatic “mmm-ing” when eating turnips. Parents need to make eating healthy feel like the norm remembering not to focus solely on taste but to talk about how much healthier they feel or how much energy the food gives them. 4) Call in the Superheroes. A recent study found that kids were more likely to eat food that their superheroes would eat. This starts by asking kids to identify which food they think their hero would prefer – junk food or healthy food. Parents can help them recall this conversation by putting a sticker of their hero right on the food or container. This is a bit controversial because many parents don’t agree with this practice. However, a study found that kids who were given a quarter to eat healthy were not only more likely to do it. The study also found that they were more likely to continue to make healthy choices even after the incentive was taken away. Perhaps most importantly, don’t try to swim upstream if you don’t have to. 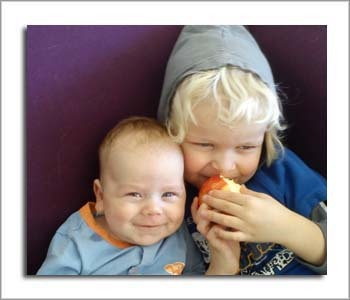 Many kids love the taste of Ambrosia apples. Instead of insisting that they eat brussel sprouts, let them eat Ambrosia apples and consider it a win. Copyright © 2011 - 2018 Ambrosia Apples. All rights reserved.